May and June are the peak summer months in India. Indian summers are extremely hot and draining. Summers are followed by monsoon rains. It’s no wonder that during summers everyone in India has the habit of looking up towards the sky in the hope to see clouds as an indicator of the arrival of monsoons. 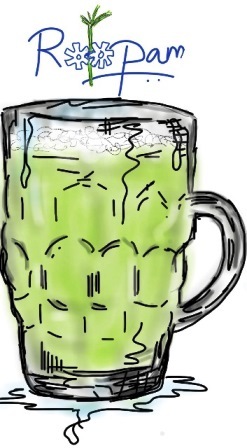 While waiting for the monsoons, Indians have a few drinks that keep them hydrated. Sugar cane juice, or ganne-ka-ras, is by far my favorite drink to beat the heat. The process of making sugar cane juice is fascinating and has similarities with ARIMA modeling.
. Consider your time series data as a sugar cane and ARIMA models as sugar cane juicers. The idea with ARIMA models is that the final residual should look like white noise otherwise, there is juice or information available in the data to extract. We will come back to white noise (juice-less residual) in the latter sections of this article. However, before that let’s explore more about ARIMA modeling. For example, in the adjacent plot, a time series data with a linearly upward trend is displayed. Just below this plot is the 1st order differenced plot for the same data. As you can notice after 1st order differencing, trend part of the series is extracted and the difference data (residual) does not display any trend. 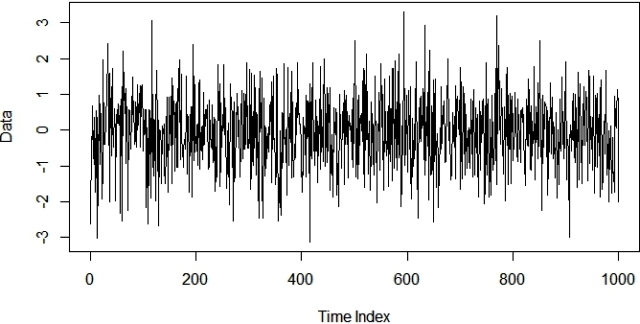 The residual data of most time series usually become trend-less after the first order differencing which is represented as ARIMA(0,1,0). Notice, AR (p), and MA (q) values in this notation are 0 and the integrated (I) value has order one. If the residual series still has a trend it is further differenced and is called 2nd order differencing. This trend-less series is called stationary on mean series i.e. mean or average value for series does not change over time. We will come back to stationarity and discuss it in detail when we will create an ARIMA model for our tractor sales data in the next article. After the time series data is made stationary through the integrated (I) pass, the AR part of the ARIMA juicer gets activated. As the name auto-regression suggests, here we try to extract the influence of the values of previous periods on the current period e.g. the influence of the September and October’s sales value on the November’s sales. This is done through developing a regression model with the time-lagged period values as independent or predictor variables. The general form of the equation for this regression model is shown below. You may want to read the following articles on regression modeling Article 1 and Article 2. Finally, the last component of ARIMA juicer i.e. MA involves finding relationships between the previous periods’ error terms on the current period’s error term. Keep in mind, this moving average (MA) has nothing to do with moving average we learned about in the previous article on time series decomposition. Moving Average (MA) part of ARIMA is developed with the following simple multiple linear regression values with the lagged error values as independent or predictor variables. If you stare at the above graph for a reasonably long time you may start seeing some false patterns. A good way to distinguish between signal and noise is ACF (AutoCorrelation Function). This is developed by finding the correlation between a series of its lagged values. 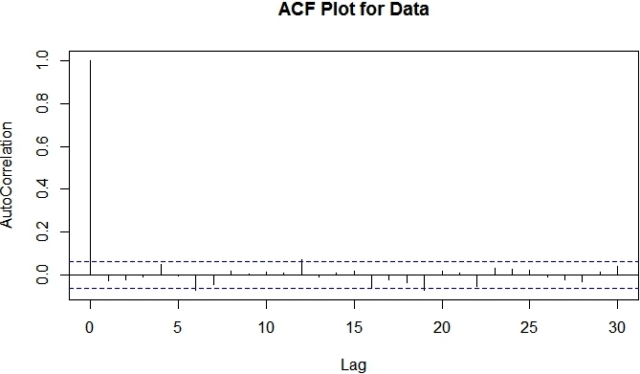 In the following ACF plot, you could see that for lag = 0 the ACF plot has the perfect correlation i.e. ρ=1. This makes sense because any data with itself will always have the perfect correlation. However as expected, our white noise doesn’t have a significant correlation with its historic values (lag≥1). The dotted horizontal lines in the plot show the threshold for the insignificant region i.e. for a significant correlation the vertical bars should fall outside the horizontal dotted lines. There is another measure Partial AutoCorrelation Function (PACF) that plays a crucial role in ARIMA modeling. We will discuss this in the next article when we will return to our manufacturing case study example. In this article, you have spent your time learning things you will use in the next article while playing your role as a data science consultant to PowerHorse to forecast their tractor sales. In the meantime, let me quickly check out of my window to see if there are any clouds out there………. Nope! I think there is still time before we will get our first monsoon showers in Bombay for this year – need to keep my glass of sugar cane juice handy to fight this summer. Nice analogy. This really help in clear understanding of the technical concepts. I enjoyed reading your blogs. Great work! 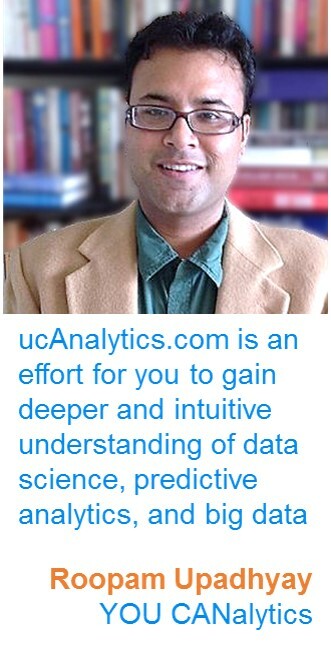 I am learning analytics techniques and your blog is very helpful. But has doubts for q – moving average of errors. Lets say we have time series data as y1, y2, y3, y4….. yn. Our ARIMA model is (0,0,1) i.e. q =1. Suppose values calculated using ARIMA(0,0,1) are appears as Y1, Y2, Y3, Y4….. I would like to know how first element Y1 is calculated. As per understanding, Y1 = c + theta(e1) where e1 is the first error. My question is – error is calculated as difference between actual value (y1) and forecasted value (Y1) and here forecasted value- Y1 – is yet to be calculated so how can error is calculated in MA part of ARIMA. That’s a good question.This is essentially an iterative calculation. Here, the error or residual (a better term) is left after AR and I terms are extracted from the series. The MA term then tries to model the pattern in this residual, if any, to make the final error looks like white noise. I have read you blog for the first time and the only word I have to say is mind blowing. Cleared lot of basic confusion for which no answer is available in any book. You make learning analytics more fun! Thanks! we are working on a long range forecasting project for their sales in 2017 using SARIMAX. We did the forecasting in SAS and now we have to migrate to R.
The issue that we are facing is a difference in Comp Percentages of sales between the SAS model and that in R.
In SAS we have fixed on the optimum p,d,q values by running the ARIMA on sales and then the lags for all the exogenous variables are fixed based on the correlation results. We also manually change the differencing orders to improve the stability of the model. While converting the codes to R, we used the p,d,q values that were inputs to SAS. The ACF and PACF graphs show that the residuals are not within the limit and hence we had change the p,d,q values by running the ARIMA of sales in R. The lags for all the exogenous variables are fixed based on the correlation results. The results that I get from this model is completely different from the results that I get in SAS. The problem is that R automatically differences the exogenous variables with the ‘d’ value of the model. We have tried to match the SAS model and R model by using the same differencing orders (i.e ‘d’ value of sales is used to difference all the variables) even then the results did not match. Could you please help us understand the reason for this or point us to someone who could. We are going to use ARIMAX for multivariate Time Series model for a pharma drug sales forecast. Would like to understand few things from you. I am new to analytic and trying to understand the MA model. I donot able to understand that why we take previous errors to forecast values in MA model. Really appreciate if you can make understand me the logic behind that. The most practical answer is that it works to have MA terms in the model for making better forecasts. The underlining assumptions here is that there are periods of higher and lower uncertainty (error terms) in a time series and they are periodic in nature. Hence, MA terms capture this periodic phases of fluctuating uncertainty. Very nice explanation about ARIMA. My question is , though we are doing difference as part of Integrated (I) its called integrated. May I know reason why its called so and why not ARDMA ? That’s a good question. Unfortunately, I don’t know the answer. If you come across some good explaination please let me know. I love your analogies. It’s a joy to read your blog. Keep up the good work! Hi this a very very wonderful post, thank you! i have a doubt what if we have a daily data and we wanna take care of the weekend values or the holidays then what should be the approach,and for the daily data how do you write the ts function i am confused whether the freq should be 365 ? Weekends will be weekly seasonality in your data if the sales peak over the weekend. However, if weekends are off then considered 5-day week and then run the model without using zero productivity on the off days. However, the picture is gross.. I mean, the person does not seem to use gloves while handling the juice, and perhaps he is drenched in sweat. I know it’s filthy, I was hoping someone will point that out :-). This is precisely the reason why one can’t drink the juice everywhere. There are a few places where they keep it hygienic. However, by and large, they are ruining a great product that has enormous potential. Ahem…so the chef cooking your dinner at the suave restaurant you like to go is wearing gloves in a hot kitchen, holding a hot stove and is not sweating at all. Thanks for these posts – fantastic resource to learn about ARIMA and time series! Wonderful explanation! You have a knack to simplifying things. Thank you so much for this great explanation! Simply Wonderful and simple explanation.Helped clear my doubts…Please keep posting.